Zappiti Explorer is a file explorer dedicated to video content. 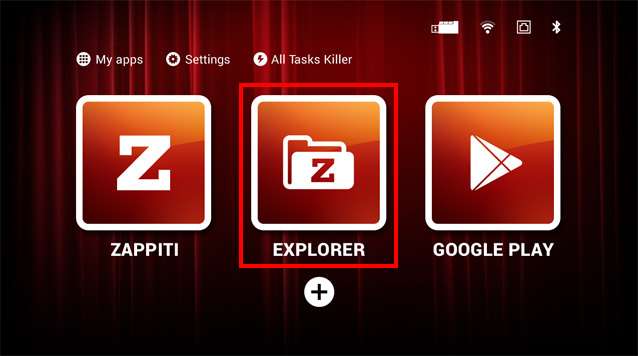 To lauch Zappiti Explorer, click on the Explorer button located on the center of the Zappiti Player 4K home page. Zappiti Explorer should display the main network devices. 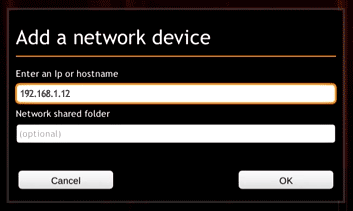 But if your network device is not displayed in the list, you can add it manually. 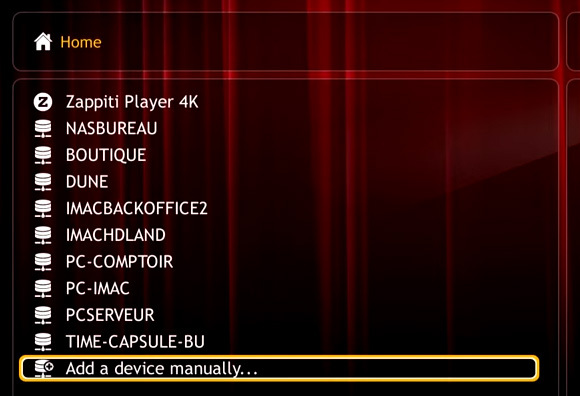 To add a network device manually, click on the "Add a device manually..." button. On the next screen, please enter the IP adress of your computer or NAS. Then, enter the login and password of your network device. Note: if you have a PC, it can be the login/password of startup of Windows. To lauch the video playback of a video file, please select the dedicated file in the list. Then, press ENTER button of the RC. To stop the video playback, press RETURN. To lauch the audio playback of a picture file, please select the dedicated file in the list. Then, press ENTER button of the RC. Then, please select the slideshow app of your choice. To lauch the audio playback of a music file, please select the dedicated file in the list. Then, press ENTER button of the RC. To stop the audio playback, press PLAY/PAUSE button. To display the additional features, please press MENU button of the RC. Note: this function is not compatible with the first versions of Zappiti Explorer.